The Center for Korean Research at Columbia University and Columbia University Press have partnered to create a Korean studies book initiative. A $10,000 subvention will be awarded each year on a competitive basis to an author who has secured a contract from Columbia University Press for an outstanding Korea-related book in any academic discipline and covering any time period. Applications for the subvention are not required. Columbia University Press will consider all Korea-related manuscripts under contract in a given year for the award. The designation “A Center for Korean Research Book” will appear on the title page of the book, along with acknowledgment of the funding source on the copyright page. Those interested in publishing in the series should send to Christine Dunbar, editor at Columbia University Press (cd2654@columbia.edu), a proposal containing a brief description of the content and focus of the book, a table of contents or chapter outline, literature review and market analysis, and professional information about the author, including previous publications. The CKR/CUP Book Series is supported by the Core University Program for Korean Studies through the Ministry of Education of the Republic of Korea and the Korean Studies Promotion Service of the Academy of Korean Studies (AKS-2016-OLU-2250006). We are pleased to announce our second title for the Center for Korean Research Book series in collaboration with Columbia University Press. In search of national unity and state control in the decade following the Korean War, North Korea turned to labor. Mandating rapid industrial growth, the government stressed order and consistency in everyday life at both work and home. 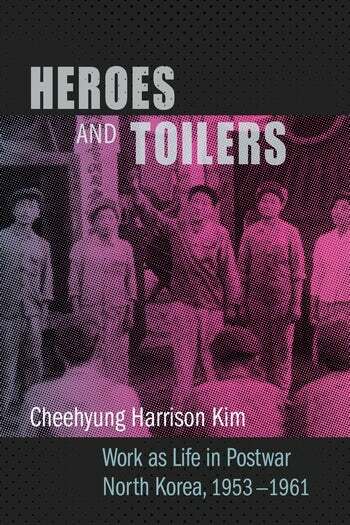 In Heroes and Toilers, Cheehyung Harrison Kim offers an unprecedented account of life and labor in postwar North Korea that brings together the roles of governance and resistance. Kim traces the state’s pursuit of progress through industrialism and examines how ordinary people challenged it every step of the way. Even more than coercion or violence, he argues, work was crucial to state control. Industrial labor was both mode of production and mode of governance, characterized by repetitive work, mass mobilization, labor heroes, and the insistence on the convergence between living and working. At the same time, workers challenged and reconfigured state power to accommodate their circumstances-coming late to work, switching jobs, fighting with bosses, and profiting from the black market, as well as following approved paths to secure their livelihood, resolve conflict, and find happiness. Heroes and Toilers is a groundbreaking analysis of postwar North Korea that avoids the pitfalls of exoticism and exceptionalism to offer a new answer to the fundamental question of North Korea’s historical development. Abstract: With the outbreak of the Sino-Japanese War in 1894, Japan embarked on a policy of territorial expansion. Acquisition of Taiwan occurred in 1895, soon followed by the annexation of Korea in 1910. Assimilation policies in Japan’s colonies led to a significant body of literature written in Japanese by colonial writers by the 1930s. After its unconditional surrender to the Allied powers in 1945, Japan abruptly receded to a nation-state, establishing its present-day borders. Following Korea’s liberation, Korean was claimed as the national language of the Korean people, and Japanese-language texts were purged from the Korean literary canon. At the same time, these same texts were excluded from the Japanese literary canon, which was reconfigured along national, rather than imperial, borders. 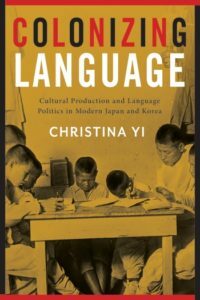 In Colonizing Language, Christina Yi investigates how linguistic nationalism and national identity intersect in the formation of modern literary canons through an examination of Japanese-language cultural production by Korean and Japanese writers from the 1930s through the 1950s, analyzing how key texts were produced, received, and circulated during the rise and fall of the Japanese empire. She considers a range of Japanese-language writings by Korean colonial subjects published in the 1930s and early 1940s, exploring the sociopolitical factors involved in the production and consumption of these works. She then traces how postwar reconstructions of ethnolinguistic nationality contributed to the creation of new literary canons in Japan and Korea, with a particular focus on writers from the Korean diasporic community in Japan. Drawing upon fiction, essays, film, literary criticism, and more, Yi challenges conventional understandings of national literature by showing how Japanese language ideology shaped colonial histories and the postcolonial present in East Asia.